Supreme Court: 1174 pass 2013 Bar Exams, Topnotcher Nielson Pangan - Balita Boss! A total of 1,174 examinees out of 5,293 passed the October 2013 Bar Examination. 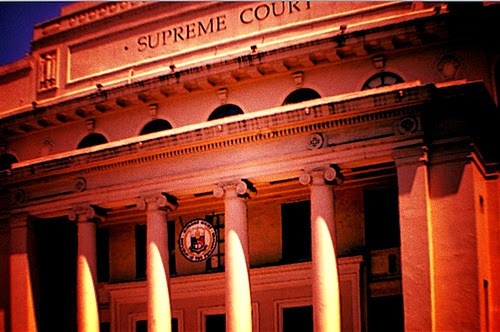 The Supreme Court (SC) on Tuesday, March 18, 2014 officially released the results. The exams were held on four Sundays last October for the third year in a row at the University of Santo Tomas along España, Manila. Nielson G. Pangan, a 2013 graduate of the University of the Philippines College of Law, topped the Bar with a rating of 85.8 percent. Four other examinees from the UP were in the Top 10. The recently concluded Bar Exams’ passing rate was 22.18 percent. That was a significant jump from the 17.76 percent passing rate in 2012, the lowest since 2000. Associate Justice Arturo Brion is the Chairman for the 2013 Philippine Bar Exam. The Bar had to adjust the passing rate from 75 to 73 due to several factors including the difficulty and type of the exam, according to Associate Justice Brion. Only 694 examinees or 13.13 percent of the total Bar takers would have passed without the adjustments, Brion added. The 2013 Bar Exam were mostly made up of essay questions (80%) rather than multiple choice (20%) compare to the previous year. The SC only introduced multiple-choice questions during the 2011 Bar Exams. However, for two year, or until the 2013 exam, results for the multiple choice question weighed more (60%) than the results for essay questions (40%) in computing for the final rating. Supreme Court said that passers will take their oath on April 28, 2014 at the Philippine International Convention Center.